The authors have developed a new tool called EnCOUNTer (Extraction and Calculation Of Unbiased N-Termini) which can determine the position of the protein N-terminus as well as the N-terminal acetylation yield for hundreds to thousands of candidates. The workflow consists of acetylated and digested proteins fractionated on an SCX column, then analyzed by LC/MS/MS. Peptide N-terminal acetylation status was investigated using the Mascot Distiller quantification option, looking at the d3-Acetyl (chemically induced modification) or d0-Acetyl (endogenous modification). The EnCOUNTer tool requires the Mascot Distiller exported file, the associated Mascot search results and an optimized parameter file. 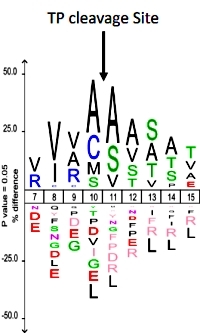 The N-terminal scoring was delineated according to six coefficients: i) peptide starting position, ii) residues around the starting position, iii) characterized N-terminal modifications, iv) alternative start positions at the vicinity of the starting position, v) matched peptide redundancies and iv) the Localization score. 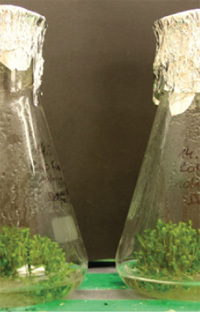 When applied to A. thaliana cell lysate, the EnCOUNTer tool was able to characterize more than 1200 N-termini of which almost 600 were quantified for N-terminal acetylation yield.